Step 1: Preheat the oven to 375°F and position an oven rack in the center. Lightly coat the muffin tin with melted butter, oil, or high-heat canola-oil spray. Whisk the flour, baking powder, baking soda, and salt in a large mixing bowl. Set aside. In a medium bowl, stir together the feta cheese, roasted bell pepper, and chopped basil. Set aside. Step 2: Pour the buttermilk into the measuring cup. Add the olive oil and the egg and whisk together until well blended. Make a well in the center of the dry ingredients. Pour the buttermilk mixture into the well and stir gently with a spatula. Mix only until there are no more streaks of flour or pools of liquid and the batter looks fairly smooth. A few small lumps scattered throughout are fine-they will disappear during baking. Gently fold in the feta cheese mixture until evenly distributed in the batter. Step 3: Use a large ice cream scoop or 2 soup spoons to divide the batter evenly among the prepared muffin cups. Bake for 18 to 20 minutes, until the tops feel firm and a skewer inserted into the centers comes out clean. Transfer the muffin tin to a rack and let cool for 5 minutes. Gently run a thin knife or spatula around each muffin to free it from the pan, lift out the muffins, and transfer them to a rack to finish cooling (careful, these are tender while hot). Serve warm. 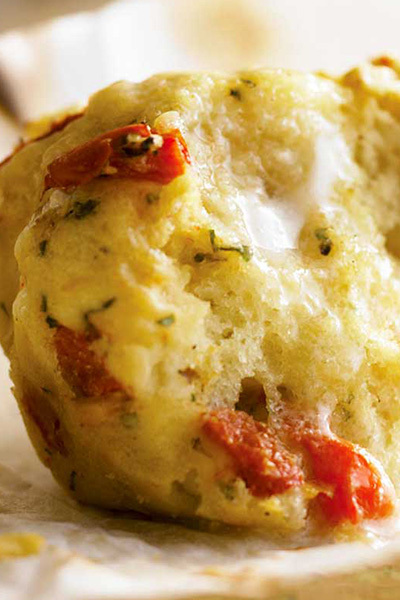 Enjoy these savory muffins from Sur La Table!